A quality computer case is essential to a gaming computer build. A computer case must provide good airflow and a stable environment for the computer components housed inside. Like motherboards, computer cases come in various sizes, namely ATX and micro ATX. Micro ATX computer cases are a slightly smaller design than their full size ATX cousins. 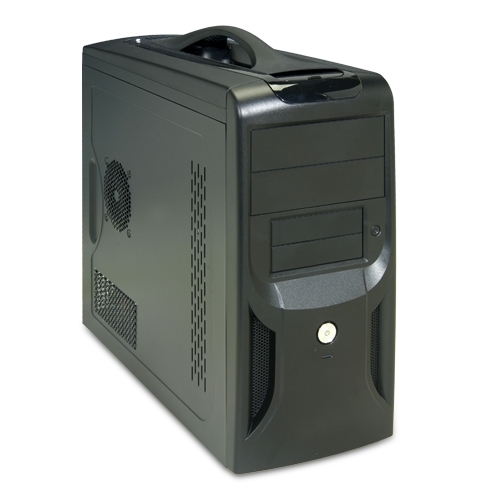 While using an ATX case is perfectly acceptable, using a micro ATX computer case presents numerous advantages. First and foremost, a micro ATX computer case is very easy to transport. This is the ideal solution for the gamer who attends LAN parties or other events in which they need to bring their computer. Some micro ATX cases even sport a handle on the top, making it even easier to carry from place to place. A micro ATX case can be the next best thing to portability aside from having a laptop or notebook. Micro ATX computer cases also see an improvement in the airflow through the case. Having a smaller size inside, the fans need to circulate less air to keep the parts cool. This prevents overheating because the warm air produced from the video card, CPU and RAM gets quickly removed from the case. Typically, micro ATX computer cases will feature at least two locations that can house a large (120 mm or bigger) case fan. Another benefit to using a micro ATX case over a full size ATX case is the associated cost. Generally speaking, micro ATX cases are less expensive than the ATX style. This is especially a concern for the budget mind gamer but still wants to play the latest games at high frame rates. Best of all, you won’t be sacrificing any performance by using a micro ATX case over a full size ATX case. The money saved on the case can be put to better use by applying it toward a nice CPU or video card. Before shopping for a micro ATX computer case, please be aware that there are certain requirements that must be met. Most importantly, your motherboard must be the micro ATX form factor. If you are unsure what form factors are, please see our article here. Another consideration is the video card size. Many newer vide cards occupy two slots inside the motherboard and can be quite long as well. Pay close attention to the case dimensions as you shop to ensure the micro ATX case can accommodate the video card. Using a micro ATX computer case presents many advantages. From their lower cost, enhanced cooling ability, and portability, you can’t go wrong with a micro ATX computer case. For a great selection of micro ATX computer cases, check out the selection available at www.TigerDirect.com.